Scientists have discovered a new planet with the mass of Earth, orbiting its star at the same distance that we orbit our sun. The planet is likely far too cold to be habitable for life as we know it, however, because its star is so faint. But the discovery adds to scientists' understanding of the types of planetary systems that exist beyond our own. 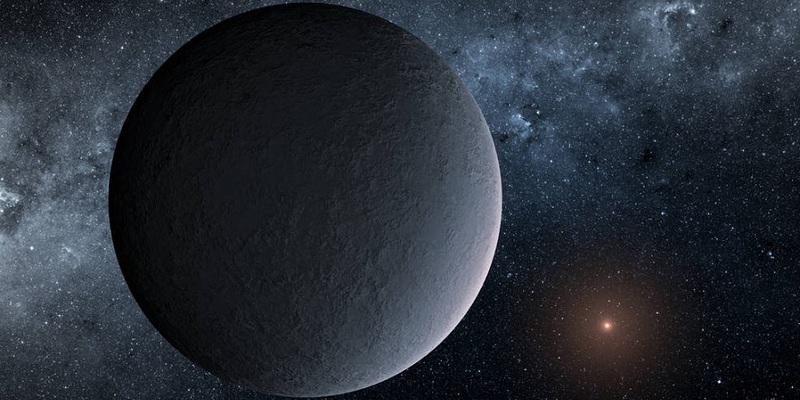 "This 'iceball' planet is the lowest-mass planet ever found through microlensing," said Yossi Shvartzvald, a NASA postdoctoral fellow based at NASA's Jet Propulsion Laboratory, Pasadena, California, and lead author of a study published in the Astrophysical Journal Letters. The newly discovered planet, called OGLE-2016-BLG-1195Lb, aids scientists in their quest to figure out the distribution of planets in our galaxy. An open question is whether there is a difference in the frequency of planets in the Milky Way's central bulge compared to its disk, the pancake-like region surrounding the bulge. OGLE-2016-BLG-1195Lb is located in the disk, as are two planets previously detected through microlensing by NASA's Spitzer Space Telescope. "Although we only have a handful of planetary systems with well-determined distances that are this far outside our solar system, the lack of Spitzer detections in the bulge suggests that planets may be less common toward the center of our galaxy than in the disk," said Geoff Bryden, astronomer at JPL and co-author of the study. KMTNet consists of three wide-field telescopes: one in Chile, one in Australia, and one in South Africa. When scientists from the Spitzer team received the OGLE alert, they realized the potential for a planetary discovery. The microlensing event alert was only a couple of hours before Spitzer's targets for the week were to be finalized, but it made the cut. "We are able to know details about this planet because of the synergy between KMTNet and Spitzer," said Andrew Gould, professor emeritus of astronomy at Ohio State University, Columbus, and study co-author. OGLE-2016-BLG-1195Lb is nearly 13,000 light-years away and orbits a star so small, scientists aren't sure if it's a star at all. It could be a brown dwarf, a star-like object whose core is not hot enough to generate energy through nuclear fusion. This particular star is only 7.8 percent the mass of our sun, right on the border between being a star and not. Alternatively, it could be an ultra-cool dwarf star much like TRAPPIST-1, which Spitzer and ground-based telescopes recently revealed to host seven Earth-size planets. Those seven planets all huddle closely around TRAPPIST-1, even closer than Mercury orbits our sun, and they all have potential for liquid water. But OGLE-2016-BLG-1195Lb, at the sun-Earth distance from a very faint star, would be extremely cold -- likely even colder than Pluto is in our own solar system, such that any surface water would be frozen. A planet would need to orbit much closer to the tiny, faint star to receive enough light to maintain liquid water on its surface. Ground-based telescopes available today are not able to find smaller planets than this one using the microlensing method. A highly sensitive space telescope would be needed to spot smaller bodies in microlensing events. NASA's upcoming Wide Field Infrared Survey Telescope (WFIRST), planned for launch in the mid-2020s, will have this capability. "One of the problems with estimating how many planets like this are out there is that we have reached the lower limit of planet masses that we can currently detect with microlensing," Shvartzvald said. "WFIRST will be able to change that." JPL manages the Spitzer Space Telescope mission for NASA's Science Mission Directorate, Washington. Science operations are conducted at the Spitzer Science Center at Caltech in Pasadena, California. Spacecraft operations are based at Lockheed Martin Space Systems Company, Littleton, Colorado. Data are archived at the Infrared Science Archive housed at the Infrared Processing and Analysis Center at Caltech. Caltech manages JPL for NASA.